Following the stern warning issued by the chairman, Academic Staff Union of Universities (ASUU), Ambrose Alli University (AAU), Ekpoma chapter, Dr. Monday Igbafen asking students not to contemplate resuming school until the on-going strike is suspended by the national body. The union and the AAU management are in for a showdown and a battle of might is currently raging as both have drawn the battle line. The university management, led by the Vice Chancellor, Prof. Ignatius Onimawo, in a bid to whip the ASUU AAU chapter into line, directed the deans and the heads of departments to invoke the “no work, no pay” law and also asked students to return to campus. The threat by the school management was seen as an attempt to coerce and box the ASUU AAU, Ekpoma to swallow the humble pie and jettison the on-going national strike. In a swift reaction, the union dared the management to implement the labour law which they tagged obnoxious and warned that they remain resolute in their quest for a better learning environment for the Nigerian students and that nothing can substitute that except the national body of ASUU says otherwise. In a statement signed by the chairperson of ASUU AAU chapter, Dr. Igbafen and made available to newsmen, he said that plans by the university administration to reopen for academic activities in the next few weeks would not work. “We wish to notify the general public that we just closed from our congress (January 21, 2019) and resolved to continue with the nationwide strike directed by our national body on 4th of November, 2018, a strike that is meant to revitalize public universities, including AAU, Ekpoma. “For ASUU AAU, Ekpoma, it is only the national leadership of the union that can direct the suspension of the strike. We are intact and in support of the on-going national strike. “ASUU AAU, Ekpoma, wishes to advise parents and guardians that the union is on strike and therefore, should be guided not to risk the lives of our students by allowing them to travel unnecessarily, because of a purportedly resumption of lectures.” the union warned. The statement added that it would be counterproductive to reopen the university when members of the union will not be available to attend to the students or teach because of the on-going strike. “The strike is total, indefinite and comprehensive,” Igbafen emphasized. The statement further warned students to stay away from the campus as ASUU AAU is not in a hurry to suspend the nationwide strike. Igbafen disclosed that the current VC has benefited immensely from the union’s struggle. “That this VC has collected more than N5.5billion and not from the state government but from TEFUND, these are products of the union’s struggle. This VC as we speak has collected more than N1.2billion from the NEEDS Assessment and by the time we are intensifying the struggle, we will ask some questions”, he said. The union took the battle further to the next level, at the ASUU Benin zone stakeholders’ meeting with the civil society organizations at the University of Benin, the issue of purported resumption by the Ambrose Alli University was also brought to the fore and the general public was warned not to take the resumption date seriously. To make matter worse for AAU management, video clips of various institutions with their alarming infrastructural decays were shown to those who were hitherto blaming ASUU for their insensitivity to the plights of the students and embarking on a prolong strike in the university. After watching the clips, one of the leaders of the civil society groups (Edo Civil Society Organisations), Omobude Agho said the civil society groups are ready to shutdown the entire system of the country through continuous protest until the federal government heed to all the demands of ASUU. “We are ready to shutdown the entire system of the nation’s economy until the federal government listen to us and address the demands of ASUU. We will mobilize people from all sectors to protest against the insensitivity of the federal government and we will not be tired. When we come out every day without a stop, they will listen to us”, he said. 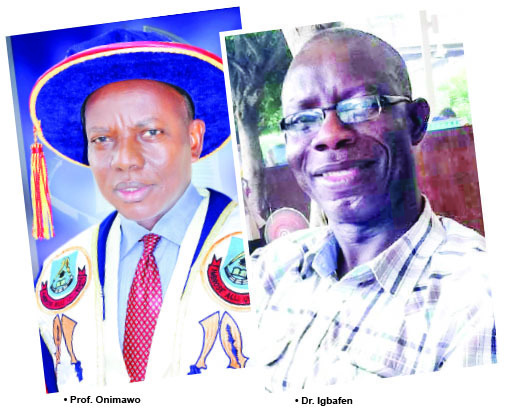 Reacting, the Vice Chancellor of AAU, Prof. Ignatius Onimawo, through the institution’s Public Relations Officer, Mr. Edward Aihevba, said the management is not aware of the directive to apply “no work, no pay law”. “There is nothing like “No work, no pay” and I do not know who has crafted that or where somebody has dragged this senate directive that is very harmless and wanting to turn it into controversy. There is no controversy here, ASUU says they are on strike. They have been on strike since November’’. According to him, the management decided to resume for academic activities to get funding to meet its monthly salary obligations. Prof Onimawo stated that the monthly subvention from the state government only meets 45 percent of staff salaries and the balance is paid from students’ school fees. He said the university could either be in solidarity with ASUU or choose to sink. His words, “We are between the devil and the deep blue sea. If we stay in the strike we sink. It is better we stay afloat while other universities are carrying on with the strike. Our university has been in solidarity with other universities who will have full benefit of the strike. “We are funded by the state government. 45 percent of our salary requirement is what we get from the state government and the balance come from our IGR which is majorly school fees from the students, which means we cannot afford to allow our students to remain at home. “We are determined in this university not to scuttle the academic calendar. Enough of students losing time. After the strike, the benefit that will come to us is on the long run. Right now the students are the ones paying the fees. We want the students not to be partially baked.” he said. On the issue of N5.5billion as alleged by the ASUU AAU chairman, Onimawo said that the union is only trying to sensationalise issue where there is non. “What I want to say, is that, all universities benefit from TETFUND intervention which was started around 2002. So the TETFUND intervention is used for capital projects that you see going around. Talking about N5.5billion, he is trying to be sensational. In his reaction, the Dean of Students Affairs, Prof. Don Akhilome, said the current imbroglio between the school management and the ASUU AAU does not fall within his purview but admitted that the university is in session. “I am not competent to speak on this matter. If it is on students matter, I will speak authoritatively. Why do you say students are the ones suffering from the strike? The students are not at home. “We have reopened the university for them to come in. I am aware that the students are in the hostels but if you have to get authoritative information about the university, you can call the university public relations officer, the university registrar or the ASUU chairman. They are in a better position to speak to you authoritatively on it. “We have resumed according to the university’s academic calendar approved by the Senate. I attended the senate meeting and it was full. If the trade union is on strike, it is understandable like I told you, management is capable of resolving it”, he said. Speaking on while the students had to resume despite the threat by ASUU AAU chapter, Okun Oyakhire AAU Electoral Commission Secretary General/Head of Students said the students are not to be blamed because they are tired of staying at home, adding that ASUU is the one sabotaging themselves and not the students. “Yes they are in school because nobody wants to go against the resumption of academic activities that is why we are in school. Everybody is tired of being at home. If the management has resolved that academic activities should resume, why not? “The new students were asked to resume because the admission they got was given by the university management and not ASUU and if the management asked us to resume, we will resume. “And when they resume, the lecturers that will attend to them are members of ASUU. If they are in school and lectures do not hold, fine. If they are in school and lectures hold, it is left for ASUU to sanction the lecturers that defied the on-going national strike. The students are not in anyway sabotaging anybody rather it is ASUU that is sabotaging themselves”, he said.